You gotta feel a little bit bad for Chantal Sutherland. 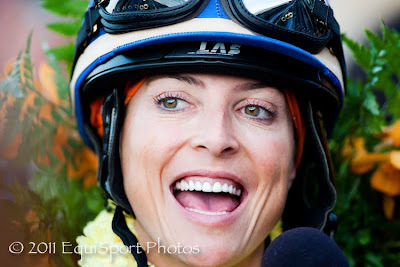 Game On Dude, her mount, survived a 12 minute Stewards inquiry Saturday after the Santa Anita Handicap, making Sutherland the first female jockey to win the 74 year old Grade 1 race. Yet the crowd of 23,304 could only register it's displeasure with the official results. “I’ve never heard anyone boo me – not even in New York,” Sutherland said. Odds on crowd favorite Twirling Candy, with Joel Rosario up, had seemingly been mugged coming out of the turn. But numerous replays showed that while Game On Dude drifted out a bit, the spent Twirling Candy lugged in causing the chain reaction. 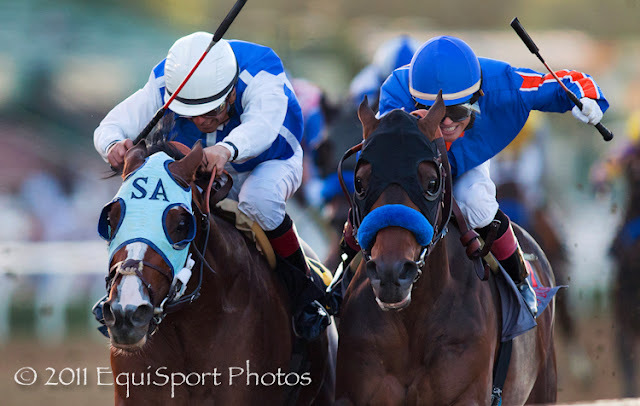 Setsuko, ridden by Victor Espinoza, was also bumped by Twirling Candy to lose momentum, but rallied to finish second. The whole cluster looked like a three-man bobsled team, out of control, bouncing down the stretch. Thankfully, everyone stayed up. Twirling Candy, rank from the gate, was never going to hit the board this day. Winning trainer Bob Baffert said after the race, “Twirling Candy, I hope fans understand, he was out of horse; he started all of the ping-ponging. I think the stewards made the right call." "When I watched the replay," Sutherland said, "I thought it was clear that Joel kind of tipped into Victor and bumped him into me." Her disappointment in the crowd was short lived, “This is by far the best win in my career. Even getting a leg up from Bob on the horse was great. I just had such a good feeling today, I’m glad it came to fruition." That's all for now... mw. Didn't see this race, but I've seen plenty of "ping-ponging" in other races and what makes ME happy is that no one fell.